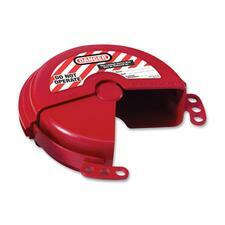 Rotating Gate Valve Lockout offers outward/inward rotation for easier installation and storage. When in place, the lockout prevents the valve handle from being inadvertently turned. Small size fits gate valve handles from 2" to 5" in diameter. Unique, patent-pending rotating design allows easier installation in confined space applications. Valve cover surrounds the valve operating handle to protect against accidental valve opening. Center knockout can be removed for rising stem gate valves. 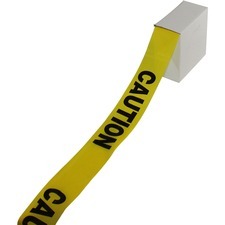 Included high-visibility, permanent safety labels in English, French and Spanish can be written on to identify the responsible person, and then erased for the next job. 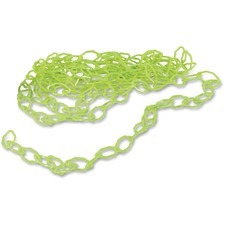 Tough, lightweight, dielectric Xenoy thermoplastic bodies withstand chemicals. Valve cover performs effectively in extreme conditions in temperatures ranging from negative 50 degrees Fahrenheit (negative 46 degrees Celsius) to 350 degrees Fahrenheit (177 degrees Celsius). 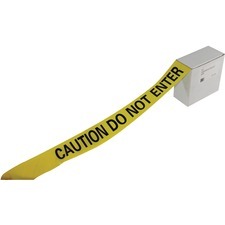 Labeled safety padlock is ideal for lockouts and meets OSHA 1910.147 standard. 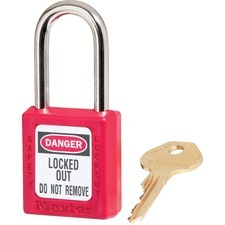 Durable, nonconductive padlock is light and easy to carry. Key-retaining feature ensures that padlock is not left unlocked. Padlock reads "Danger. Locked Out. Do Not Remove." and has a six-pin, tumbler cylinder that is keyed differently. 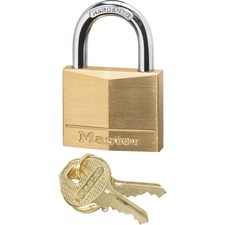 Medium-duty padlock offers the corrosion protection of a solid-brass, 1-9/16" (40mm) wide body and cylinder as well as four-pin tumbler security and hardened steel shackle. Padlock includes a pair of brass keys. 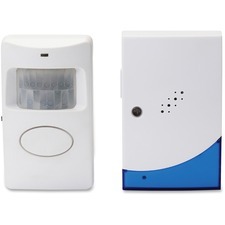 This motion-activated chime features a remote receiver that operates up to 200' away. Wireless chime features a convenient on/off switch and lets you easily control the volume. The chime's detection range reaches up to 20' with an angle up to 100 degrees. Chime is paired by code with a chip in receiver so that multiple chimes in close proximity may be used and only the desired receiver will sound. Chime includes an angle-adjustable mounting bracket to direct the sound conveniently in multiple directions. Chime comes programmed with 32 different ring options including a familiar ding-dong tone. FCC Certified chime operates on three AA batteries plus a 1.9-volt battery (all sold separately). Two-piece, ball valve lockout set includes one handle-on and one handle-off ball valve lockout to fit virtually any ball valve from 1/4" to 4". Handle-off version can also be used to keep valve open. 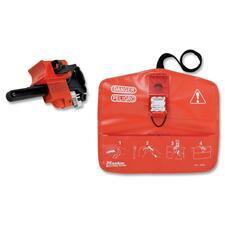 Both lockouts are lightweight, compact and easy to use. Panoramic dome mirror allows personnel and others to move safely through intersections and corridors while providing overhead surveillance. Domed design offers a 360-degree view for complete collision prevention and surveillance. Virtually unbreakable, lightweight acrylic displays a super bright image that will not fade with time. 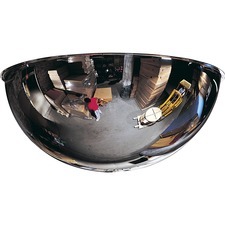 Dome mirror is perfect for use in hospitals, clinics, industrial warehouses, retail facilities and more.